PAPER: How long does it take a weaver to build a nest? Williams R. 1977. The masked weaver: one of nature's fantastic construction engineers. Wild Rhodesia 13:6-7. For this study the author observed a Southern Masked Weaver building his nest. 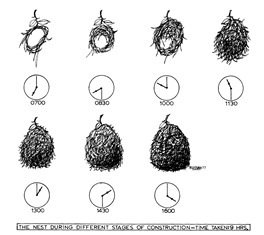 The author photographed the progression of nest building every 1.5 hours and sketched the result in this article. He observed a female investigating the nest but did not accept it (the author incorrectly states that the female destroys the nest if she does not approve). He then collected and dismantled the 30g nest to study the nest material used. An illustration shows the total pieces and sizes used in different parts of the nest. How long did it take for the weaver to build the nest? In this case, 9 hours, using 630 pieces of material, which means an average of 1 piece every 51 seconds! However, a male can collect several smaller blades of grass at one time, meaning that the interval for collecting material is probably longer than 1 minute in practice.